Back to school season is a good time for looking ahead at the year to come and looking back at days past. To reminisce about the times and the people we held dear...and sometimes, those who never existed at all. 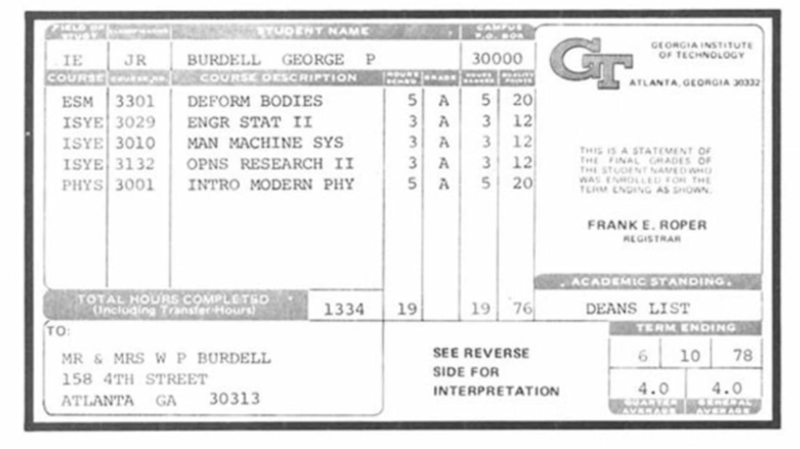 George P. Burdell was a student enrolled at Georgia Tech in 1927. He wasn’t real, but rather, the result of a practical joke carried out by an actual student, William Edgar Smith. When Smith was accepted, he was accidentally sent two registration forms instead of one. Spotting an opportunity to seize the day, he filled out both forms—one for himself and one for a creature of his imagination who went by the name of George P. Burdell. The name was taken from the president (and former UGA football captain) of the Richmond Academy of Augusta, Ga.—George P. Butler—where Smith went to high school. Smith was able to make the ruse last by enrolling Burdell in classes and turning in assignments for him (with some help from friends). The elaborate prank lasted all the way to graduation day, when Burdell earned his degree in Mechanical Engineering. Presumably they didn’t take attendance back in those days. Other students have fueled the Burdell story to this day. After graduating, he flew 12 missions in a B-17 Bomber in Europe during World War II (and several wars since), served on MAD magazine’s Board of Directors from 1969 to 1981, and even showed up in the polls for TIME magazine’s “Person of the Year” award in 2001. The alum is beloved back at school, with a Facebook profile and page dedicated to his legacy, and there’s even a store in Georgia Tech's student center named "Burdell's." He also has a Georgia Tech faculty page, where he’s listed as: “Helluva Engineer and Namesake of the future Burdell Center.” Burdell is said to have joined the staff in 2005. His contact info and office hours are noticeably absent. Despite changing technology in registration, students have continued to successfully enroll Burdell several times throughout the years, and each year on April 1st, the school throws a birthday celebration for the “Spirit of Georgia Tech,” George P. Burdell. And earlier this year, even President Obama got in on the action when he spoke at the college—he began his statements with: “Now, I understand George P. Burdell was supposed to introduce me today. But nobody could find him.” That Burdell. So elusive.